With the rising popularity of permanent makeup and microblading applications, there are many choices to make when it comes to choosing the right beauty studio and permanent makeup artist here in Peoria. This can ensure that you get the highest quality work, in a safe and sanitary environment, from a highly trained and skilled professional. At Celebrity Lash and Brow Design, we want to help you find the permanent makeup artist that is right for you, who can help you achieve your beauty enhancement goals. Here are a few important aspects to consider when looking for a permanent makeup artist. It’s important for you to research any beauty studio and artist before fully committing to receiving a service from them. You’ll want to check their credentials to ensure they are an accredited business, operating with the appropriate licenses. You should also inquire about continuing education accreditations, certifications, and other aspects required by the State of Arizona or any other state. Most businesses these days use social media sites to reach their target audience, so these are always great resources for prospective clients to research. You can access their business information, hours of operation, portfolios, galleries, and see what other clients are saying about them. Always look for before and after photos that showcase their talent. This will also give you a good idea of their attention to symmetry, consistency, linework, and use of colors and pigments. It’s always a good idea to meet with your permanent makeup artists before the actual procedure. This gives them a chance to look at your facial structure, make appropriate measurements, choose the pigments, and discuss your goals and the results you hope to achieve. It’s also a great way to build a relationship with the artist so that you feel much more comfortable and at ease before your appointment. Do they use one-time-use needles? Do they have the proper disposal methods for getting rid of used supplies? Do they sterilize the application chair, table, and other supplies? 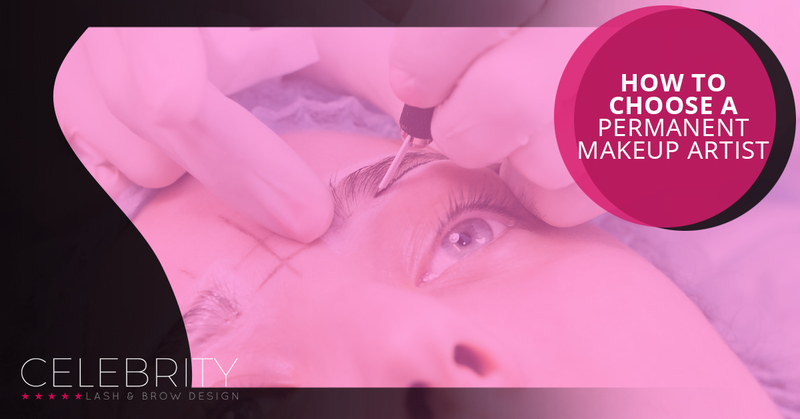 If your permanent makeup artist follows and exceeds the safety and sanitary regulations, they will be more than happy to tell you about their best practices to give you peace of mind. The more questions you ask, the more at ease you will feel when you come in for your permanent makeup procedure. Now that you have the tools to choose the best permanent makeup artist for your needs and beauty goals, check out our permanent makeup and microblading services. We would be more than happy to talk with you about our procedures, methods, and share with you our best practices prior to your visit. Call us at Celebrity Lash and Brow Design today with any questions you may have, or to schedule a consultation for permanent makeup in Peoria. We look forward to seeing you!